How do I change Sample Store & Sample Slogan? 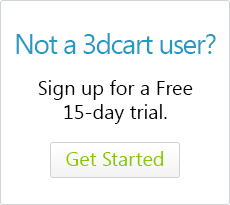 When you first open up your 3dcart store, we add some placeholder text into the Store Name and Store Slogan areas so you can see where they will appear on your chosen theme. When you get to this page, there will be a series of tabs found along the top. Be sure to select the first tab which is labeled "Store" On this tab, you will see two fields for Store name and Store slogan. Be sure to click the "View Store" link at the top of your Online Store Manager to clear the site cache before viewing. Otherwise, there's a possibility that you will still see the old information until the site cache clears itself. If you prefer, you can also use the same page to upload a logo to your store. Clicking on the "Browse" button (For "Store Logo") will take you to the store's File Manager where you'll have the opportunity to browse to and select your logo image. After specifying the logo, click save to have the change appear. When specifying a logo image, the store will no longer display the store name and slogan on the home page. However, be aware that store name and slogan will still be used on other sections of your store for example invoice templates, email templates, page titles and many other areas of the site.